Colonel Moody was Chief Commissioner of Lands & Works, a civilian post overseeing land settlement, road construction, and public buildings, and as officer commanding the Royal Engineers was responsible for the defence of the Colony. With New Westminster, on the right bank of the Fraser, struggling to survive as the supply center to the Fraser River gold district, and with abiding anxiety that the Colony of British Columbia would be overrun by Americans, civilian and military, Colonel RC Moody was unprepared for a minor rush of settlers to the land opposite the city of New Westminster in the spring of 1860. By a Proclamation dated January 4, 1860, Governor James Douglas opened up unsurveyed land in British Columbia for settlement by pre-emption. A settler could register a claim of up to 160 acres. When the lot came to be surveyed, he needed only to show he had occupied and improved the land, and pay 10 shillings an acre to complete the purchase. A large section of land had already been surveyed under contract by Joseph William Trutch in preparation for opening up the region to settlers, but as yet not a section had been sold between the Fraser River and the international boundary at the 49th parallel. A further proclamation stipulated that these surveyed parcels must be offered first at a public auction, with unsold lots afterward thrown open to purchase at the upset price of 10 shillings per acre. On January 20th 1860, Moody wrote to Magistrate Warner Reeve Spalding at New Westminster, requesting that he refrain, for the time being, from accepting pre–emption claims for land on the frontier side of the river, "on account of Military considerations of grave importance." Moody outlined his own strategy of land occupation to Governor Douglas. I have the honor to inform you that persons are seeking to obtain Pre-emption claims to land on the bank of the river opposite this town, and that I have deemed it right to request Mr Spalding not to accede to any of them without a previous reference to me, reserving the country from two miles above the junction of the Pitt with the Fraser rivers, to six miles below New Westminster, and from that line across to the American Frontier. . . The land immediately opposite the City should not on any account be parted with except by lease on reasonable terms with power of resumption on the part of Government; the Government reimbursing the lessees for outlay at an appraised value . . .
the occupation of the whole of that district should be subject to the important military consideration of the defence of the Frontier." Pressure for settlement land was mounting south of the city, but Douglas did not hesitate to endorse Moody's restrictions and instructed Mr Spalding to accept no pre–emption claims unless approved by Moody. Surveyed land near New Westminster, on the opposite side of the river, which may be desirable at present to reserve upon military considerations, or for military allotments, may be leased on low terms, subject to military presumption, but with the understanding that the lessee shall have the option of purchase should the land hereafter be sold by the Government. Recognizing the need to "sustain life," and the opportunity to defeat the "famine prices" of imported food, the first to establish a farm opposite the city was Samuel Weaver Herring, an early resident of New Westminster. In March 1860 Sam Herring obtained a lease of the land of the old Revenue Station across from the Royal Engineers Camp. Sam Herring was thirty years of age, an American born in Maryland and former resident of Pittsburgh, Pennsylvania. He had been in California in 1850, first in the gold fields, and later operating a San Francisco Hotel with his parents John and Mary Herring. He next moved to Crescent City, California and came up with the rush of '58 to Whatcom, thence to Fraser River. Herring's family consisted of his wife Hannah, also thirty years old, and children Tillman, 4, born in San Francisco, Annie 2, born in Crescent City, and John, born at Whatcom. A son Henry would be born soon after their arrival, one of the first colonists to be born in British Columbia. Sam Herring soon established a bountiful farm on the south bank of the river extending from the old Revenue Station inland and along the river to the Indian village primarily occupied by the Musqueam Chief Tsimlana. In February 1860 Colonel Moody once again proposed a trail be cut from opposite New Westminster to the frontier. He advertised for tenders for a road to Semiahmoo, but the only offer came from former Customs Officer William Jeffray, and while his offer included a ferry across the Fraser River, the terms were not favorable to the government. This was a disappointment to Moody for commercial as well as military reasons. 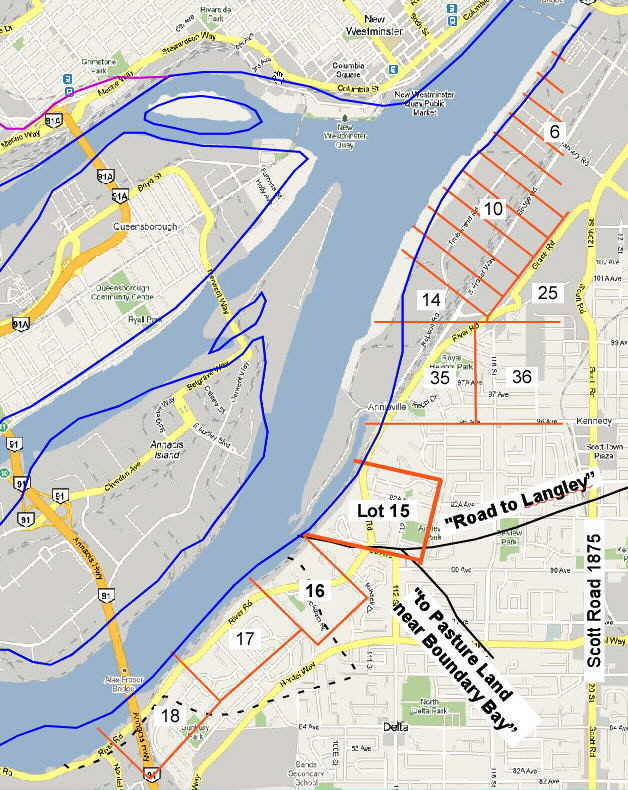 Moody was establishing a network of major roads radiating from New Westminster. There were three roads to salt water. 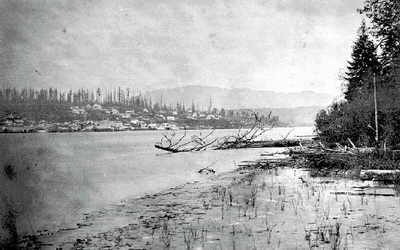 The North Road from the Engineers Camp to the head of Burrard Inlet was the first, built out of military necessity, to connect the City with an ice–free anchorage. There was also a road to False Creek and the extension of the Douglas Road to the second narrows of Burrard Inlet. 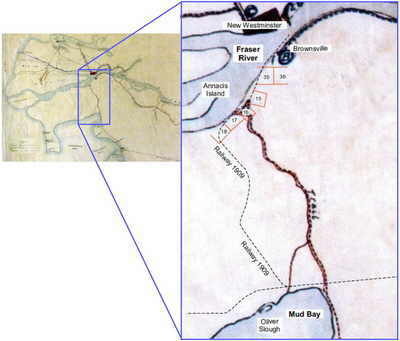 Two roads followed the Fraser: one east to the Pitt River; one west along the North Arm, past the sawmill that had been built by Thomas Donahue. A proposal from Cyrus A Brouse to build a road from Kennedy's farm to Langley, passing through the land that would be opened up for sale, met with interest from Governor Douglas. The proposal received a vociferous objection from Moody. The line Mr Browse proposes passes at a considerable distance from the banks of the river opposite the city and terminates at a point on the river far below it on the Frontier side namely at Mr Kennedy's farm! In Moody's view the road should terminate above the city opposite Mary Hill and proceed down the river bank to a place suitable for a ferry. The road as proposed would create a "rival town for the benefit of a few private individuals". The clamor to obtain settlement land opposite the city intensified. City merchant William James Armstrong tried to obtain pre-emption rights to a parcel of 160 acres of surveyed land (Sections 34 and 35, B5N R2W, Trutch's survey). Stymied by Moody's embargo, he then tried to lease the land, which lay at the southwest corner of the flats opposite the City. Other persons with an interest on the left bank included the Reverend Edward White, who claimed 30 chains frontage adjacent to WJ Armstrong, and John Robson, who laid claim to 50 chains of property along the river bank upstream from Armstrong and White. All of the men claiming land on the south bank of the Fraser River were non–establishment Canadians, with Sam Herring, of course, American. Your Excellency sometime since determined that the surveyed Rural Lands opposite New Westminster should no longer be reserved and I do not therefore oppose their occupation. Two or three persons holding Scrip . . . have selected the land to which they are entitled by such scrip, on that side. Scrip was a voucher for land purchase, a Certificate of Claim to a designated number of acres. It was a common form of payment for work done for the Government. A road builder would receive payment partly in cash and the remainder in Scrip, saving funds for the cash–poor Treasury. The Scrip could be sold to a third party. It was initially valued by the upset price of land, ten shillings an acre. The person claiming to be entitled hereunder must select the quantity of land hereby designated, and if the land be surveyed, must exchange this Certificate for a conveyance, or if the land be unsurveyed, must exchange this Certificate for a Certificate of Title, within Twelve Months from the date hereof. William Armstrong, Moody continued, has purchased scrip and tenders it for surveyed land and it appears legal, and the opinion of the AG is requested. Others with an interest in the south bank included Edward White, the Methodist minister, and John Brough and John Robson. Robson had chosen land and begun to clear it. They had all taken their Scrip to the Magistrate and exchanged it, as per regulation, for a conveyance to certain pieces of land. With the Proclamation that surveyed land would be sold by auction, all Scrip claims were called into question. In August 1860 Moody ordered a new survey of the flats immediately the city of New Westminster. 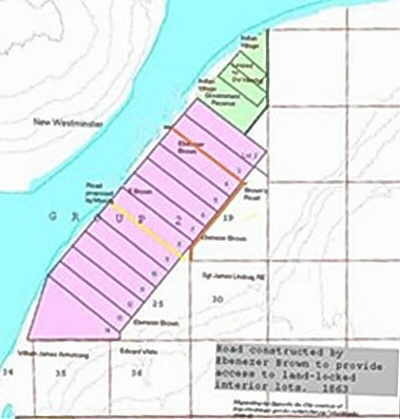 This land was first surveyed the previous year by private contractor JW Trutch under the block and range system, with each quarter mile section 160 acres. As land in proximity to the City was most in demand, and river access at a premium, the Royal Engineers overlaid 14 new, smaller lots, each with river frontage. Lot 1, an irregular–shaped parcel of 100 acres opposite the Camp, was designated a Government Reserve, comprising the land of the old Revenue Station occupied by the Herring family, and the adjacent Indian rancheries. Twelve lots numbered 2 to 13 were laid out with 10 chains frontage on the river, each 45 acres in area. Lot 14, the final lot of irregular shape at the southwest corner, amounted to 74 acres. On February 9, 1861, the string of twelve 45-acre parcels of land, and one of 74 acres, opposite New Westminster, each fronting on the riverbank, was auctioned off along with other surveyed sections, amid a storm of protest. John Robson, who had previously applied Scrip which was subsequently refused because the land must be sold at auction, held up a notice of protest. I hereby forbid the sale of lots No 3, 4, 5, 6, & 7 upon the south bank of the river opposite this City, as I have possession of the same under a Government "Certificate of Claim. John Robson New Westminster 9th Feb, 1861." The only lots sold were those (thirteen in number and amounting in extent to six hundred fourteen acres) situated on the other side of the River opposite the Town and one Lot of Sixty–four acres on the right bank of the River at its mouth. On five of the former Mr John Robson had wished to apply his Scrip, and in order to strengthen his claim had made a small clearing. On the first of these five being offered for sale, he handed to the Auctioneer a written protest which was read out and in which he stated that he 'forbid the sale of lots No. 3,4,5,6 & 7 upon the south bank of the river opposite this City, as I have possession of this same under a Government "Certificate of Claim." Complicating the matter, Robson successfully bid for the lots at the auction, and when called upon for a deposit, he once again tendered his Scrip. It was refused and the land again auctioned off, with the successful bid entered by Ebenezer Brown. The purchaser at the second auctioning of parcels 3, 4, and 7 was Mr Ebenezer Brown, who, with the establishment of his ranch, would make the most lasting contribution to the development of the lower Fraser, and New Westminster, including giving his name to the settlement of Brownsville. William J Armstrong, who had similarly tried to purchase the land he had claimed on the south bank of the river, was more fortunate in that no one put in a bid for it. It being then open to purchase at the upset price, he could tender his Scrip and it was accepted. Armstrong published a card of thanks to everyone for "not bidding on my land." His property was the furthest downstream, where the uplands met the river. His neighbor further west was James Kennedy, who established his Ramparts Farm by pre–emption of un–surveyed land, Lot 15. The whole of the surveyed lands have now been put up at auction and any person may now claim any unsold portion of the same at the upset price. The prominent settlers on the left bank of the Fraser River opposite New Westminster, each of whom established ranches, were: SW Herring, lessee of Lots A and B in Lot 1, across from the Engineer's Camp at the old Revenue Station; Ebenezer Brown, Lots 3,4 and 7, directly across from the City; WJ Armstrong, Sections 34 and 35, Trutch's survey, where the uplands met the flats; and James Kennedy, Lot 15, pre–empted land about two and a half miles downstream on the heights. Sandwiched between Armstrong and Kennedy's farms was a 56 acre wedge of land, (latterly called Lots 23 and 24), claimed by the solitary Patrick O'Brien Murphy, who had first homesteaded on a small island in the river, generally known as Murphy's Island. The remaining lots of the twelve 45–acre parcels and one 74–acre lot in Group 2 were knocked down to speculators at the auction. Charles S Wylde bought Lot 11 which would be soon sold on to San Francisco iron man Peter Donahue. Charles S Finlaison and William H McCrea partnered in the purchase of Lot 6. Both were clerks employed by at the Custom House in New Westminster. The largest lot of those surveyed by the Engineers was the irregularly–shaped Lot 14, farthest downstream. This was taken by Capt John Marshall Grant of the Royal Engineers. Speculation was rampant among the moneyed British class, who could afford to purchase much land, while legitimate settlers, with little ready cash, were frozen out. It has been often observed that the State of Washington gained many hundreds of settlers who had come to the gold rush, and had taken up land in that Territory, only because they could not obtain land in British Columbia. From Laing's Colonial Pre-emptions and government records. 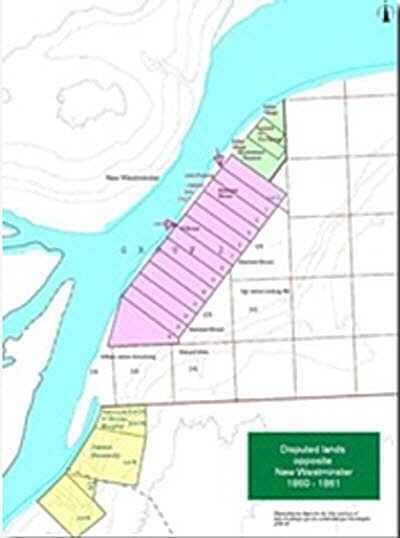 One other surveyed lot was sold to WD Gosset, 64 acres in Mr Trutch's survey, at Garry Point at the mouth of the Fraser River (B3N R7W Sec 9). +Sam Herring died in 1879, after farming on the south bank since 1860. The lease was still registered in his name. His wife Hannah and her children held on to the property. John Herring, owner of Lot 2 in 1880 was Sam Herring's father. +++Laing wrongly identifies Jefferson Perry as the man known as "Mountaineer Perry." The Mountaineer was Albert Perry. In December 1861, Colonel Moody, in his role as Chief Commissioner of Lands and Works, announced his project estimates for the coming year. His wish list included "improvements to Trails from opposite New Westminster through Derby, Langley, and Sumas to Hope, with completion of branch to Semiahmoo." In late December 1861 winter was nowhere to behold. In walking today with the Archdeacon I passed a garden that of a colored man on Johnson St where there was a well–developed apple blossom on one of his trees, a sign of a remarkable mildness." The pleasant conditions belied what was to come. By the first week of January cold winds had descended the Fraser and brought "a week of continuous severe frost." Capt Parsons wrote to the Governor that New Westminster faced the possibility of being cut off by ice in the river. The Fraser River was soon frozen up from the mouth to Hope, cutting off river travel and supplies. The Kennedy trail to Mud Bay and the North Road to Burrard Inlet, were the only access to the vicinity of New Westminster. James Kennedy, who had been hammered in the press and in public during the construction of his trail, took time to address his critics with a letter to the Columbian, trumpeting that the people of New Westminster had been "saved by that trail." Nine fat beeves were driven on the ice from the mouth of the trail on the south side of the Fraser to New Westminster. These fat cattle were part of a drove which was brought from Oregon to Mud Bay by a party of enterprising Yankees. They were landed at Point Roberts after the ice had closed the Fraser, and brought across to Mud Bay, and from there by the trail (that I opened last season) to the river. This circumstance is the more worthy of notice for two reasons. The first is that [Thomas] Harris, who had the contract for supplying the [Engineer's] Camp, was out of beef, and was obliged to get a supply from these Yankees, who invaded British soil with their fat cattle. And the other reason is, that at the time I first proposed to open a trail to Mud Bay, the people of New Westminster opposed it at a public meeting, and refused to vote for an appropriation for that purpose, and after I had succeeded in getting the contract for opening the trail, there was every possible effort made to stop it. Colonel Moody had previously ordered the eradication of trails to the south for fears of American invasion, and the people of New Westminster were jealous of protecting the commercial prominence of their port of entry. Having been cut off by ice time and again, the colony renewed efforts to establish communication by road from the lower to the upper Fraser, but the necessary funds were not available. a trail, if not a good wagon road, is much needed from some point opposite or near New Westminster to Langley. . . There was a futile attempt made something more than two years ago to open a trail to Langley, starting from a point about five miles up the river [Girard's road]. But we think the starting point was not in the right place, and we know the line chosen was a blunder . . . by starting opposite this place it would intersect a longer extent of valuable country and would generally be more useful. Projected roads to Semiahmoo and Langley did not materialize. Ebenezer Brown, on his own initiative, set about constructing a road between two of his properties, just down river from the Indian reserve. With Moody's acceptance the layout of the principal roads in this district was established. 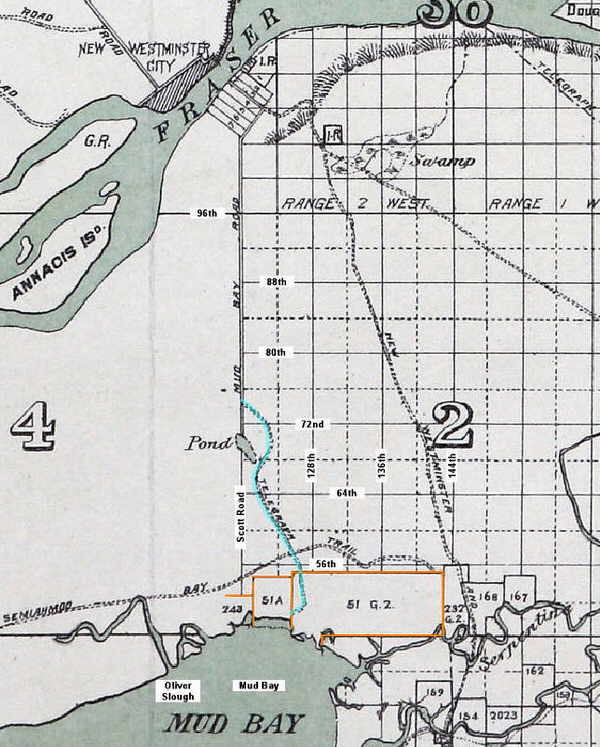 Brown's self–made road between lots 3 and 4, even now running a little bit crooked, would become the start of the Semiahmoo Road, now the lower end of the Yale Road. 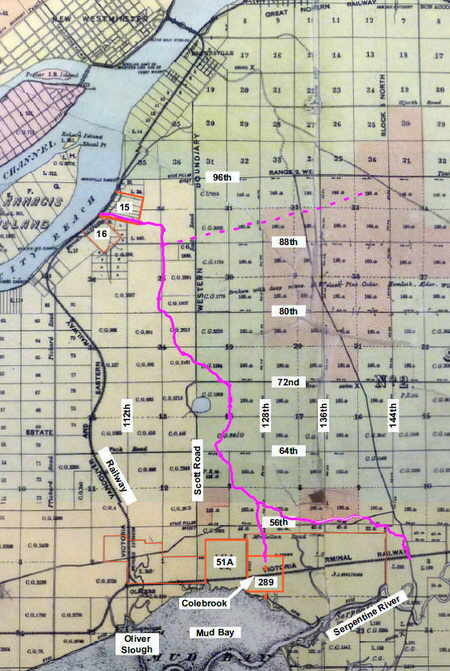 His baseline allowance would be the route of the Scott Road, even today running outside the southern boundaries of the lots of Group II on land given up by Brown from his 160 acre Sections 19 and 25. But these roads would not be improved into wagon roads until the 1870's. The side of the river opposite the City was becoming a popular place for picnicking and recreation. The sandbars along the bank were amenable to bathing and the clearing of fine meadows afforded places for recreation and paths for strolling and riding. In August the Methodist church advertised a day of relaxation. Picnic – The annual picnic in connection with the Mary Street Wesleyan Sabbath School will take place today on Mr Brown's ranch opposite this city. The boats will leave the dock shortly after 11 o'clock, A.M. The force of Royal Engineers was recalled to Britain in 1863. Every officer returned home, but many enlisted men and non-commissioned officers remained in the Colony, attracted by an offer of 150 acres of land on which to settle. Military concerns had quieted considerably after 1860, and the Americans were preoccupied with their own internal struggle, the Civil War. Still, with the recall of the Engineers to Britain in 1863, New Westminster was left feeling exposed and without defence. A militia unit named New Westminster Volunteer Rifle Corps, No. 1 was organized with Ebenezer Brown taking a leading role, and an Artillery Corps also formed, each company comprising a large contingent of former soldiers. The south side of the river assumed a new kind of military importance – as a practice range and as an artillery target. Two field pieces would be trundled up to the bluff at Albert Crescent, and take aim at the Brownsville Butts, at a range of 1200 yards across the river. Years later shells and cannon balls would be dug up out of the South Westminster soil and no doubt there are many there still. In 1865, a new enthusiasm and impetus to road–building came in the form of a telegraph line. Intended to connect North America with Europe by land, the line would run right through British Columbia from south to north, and thence to Siberia. The people of New Westminster relished the thought of being in direct communication with California and the rest of the world, especially since Victoria would be shut out. The possibility of a land route to accompany the line would be salvation in winter when the river was impassible. RT Haines, the Assistant Superintendent of the California State Telegraph Co, wrote to Governor Seymour asking that the Colony clear the way for the Telegraph from the border to New Westminster. I would suggest to open a good trail from a point opposite the upper end of the village of New Westminster, to connect with the present trail to Semiahmoo about one and half miles south of the river, thence follow the trail to Mud Bay, thence by the most direct practicable line across the prairie and through the timber to the Boundary Survey Camp at the head of Semiamoo Bay. That was not all. He also asked that poles be laid out 20 feet tall, 71 yards apart. The Government was obliging. Such activity raised moral in this time of economic depression, and the construction activity would give a boost to the prospects of New Westminster. On March 17 the USS Shubrick, in former days in the service of Boundary Commissioner Campbell, reappeared at New Westminster bearing Colonel Bulkley and the underwater cable for the Fraser River crossing. The first telegraph message in British Columbia on the line was received by JL Pitfield at the Telegraph Office newly opened in the City at the old Columbian Hotel, across Columbia Street from the Mansion House. Opposite New Westminster, March 21st, 1865, 11:45 a.m.
To the Editor of the British Columbian. We have to announce that the cable is laid and working. It was laid in seven (7) minutes. Communication with the rest of the world would have to wait until April 18, when connections were completed on the line to Seattle. The first news received was of the death of President Lincoln. Pre–emptor James Kennedy put aside an attempt at homesteading to become a teacher, removing to Derby in 1867. Kennedy opened a school in the old Barracks, advertising that it would accept "boarding scholars." The school remained at Derby until October 1869 before acquiring a more convenient location at Fort Langley. Kennedy settled there, where he remained teacher until 1872, afterward moving to Chilliwack. James Kennedy, now living in Langley, advertised a sale of stock and land of his old pre–emption down river from Brownsville. In March 1871 an advertisement that would run for many years appeared in the newspaper, announcing Ebenezer Brown, "Wine and Spirit Merchant." The same day it was announced that "The contract for building a wharf and felling the timber on the new road to Semiahmoo is already completed and the work will be commenced without delay." While the announcement of roadwork was a little premature, there was indeed great pressure from commercial interests in the City for construction of a road that would bring them new business. They looked to the growing population of Mud Bay and on the American side, Semiahmoo. Our hotels that are now so comparatively empty . . . We should become here the market for English goods for the whole of Puget Sound. . .direct transmission of the mails. . . a good practicable trail would answer the purpose for a year or two. . .it is essential for the prosperity of the Fraser valley, particularly of New Westminster. A cold snap broke in the first week of January 1872 but the break-up of ice carried on the flood tide in the Fraser River wreaked havoc at the New Westminster wharfs. Immense fields of ice, most of which was fully twelve inches thick, came slowly up the river, but with the weight and force of a thousand tons, carrying everything before it. brought down the whole of the ice from above the city as far up as Langley like an avalanche, and carried away the corner of the Enterprise wharf . . the ice sweeping everything before it. Fifteen miles from the sea, at New Westminster the rise of the Fraser River at full tide is about five feet. The last week of April 1872 work began on the cutting of the new route to Yale. From the Landing, Ebenezer Brown was footing the bill for the road through his property, between Lots 3 and 4. His involvement would extend to the base of the hill. From the point over the hilltop where the Semiahmoo Road branched off, the Yale Road would be cut ten feet wide, making a bee line for Mt Baker, through the next settlement at Langley. The Semiahmoo Road at last saw some progress after years of promotion and including petitions from the American side of the border. In Washington State a Post Road was gazetted from Whatcom to Semiahmoo and settlers there looked for a northward link to New Westminster. The road from Brownsville was surveyed by Alfred Howse, but his route, which followed in part the old Mud Bay trail, was deemed unacceptable. George Turner laid out the final route, following a more direct line. Howse and Turner were both former REs. One of our old citizens, Mr Brown, has leased from the government a piece of land on Mud Bay, for the propagation of the oyster. . . An example of such enterprise as that of Mr Brown, is most valuable, as it stimulates the desire to seek for new branches of industry, and opens up new fields for all who are willing to work. Under the Terms of Union with Canada in 1871, a restriction was in place upon land in the Fraser Valley which might be claimed by the Dominion for the railway. This placed a straightjacket on settlement south of the Fraser and since the Trutch contract of 1859, and the small survey done by the Royal Engineers on the lots opposite New Westminster in 1860, no systematic survey of the lower Fraser Valley had been attempted, nor could any map be produced which would identify those lots which had been pre-empted or to provide a guide to prospective settlers. Accordingly, the Surveyor General wasted no time in acting when the Railway Belt freeze expired. According to official maps, 100 acres of land surrounding the old Revenue Station was designated a "Government Reserve." It was indicated to be occupied by an "Indian Village," but not included on a list of Indian Reserves proper. The south side of the river, from Brownsville to Semiahmoo, was sparsely settled, and remained so, even after a Government Auction of lands on September 30, 1873. In the south, along the border, some 15 sections of land, each 160 acres, attracted a buyer for one section only, at the upset price of one dollar an acre. Some lots were available above Brownsville, "situated at the back of Mr Sam Herring's dairy farm, opposite New Westminster city." The newspaper reported them to be "mostly of an inferior character, and consequently no buyer offered." At a time when only agricultural land held value, the forested district now comprising a City Centre could attract not one dollar an acre. Contracts for the trunk road, Brown's Landing to Semiahmoo Bay, were let this year in four sections. It would take some years before all the contracts were completed. The Governor's tiny steam vessel, Leviathan, another historic vessel that made its first appearance at Semiahmoo in 1858, was employed to lay the cable across the Fraser, from the south–west corner of Brown's farm to Albert Crescent. Brown continued to invest heavily in his Brownsville property, with continuing improvements to the wharf and road employing a party of 15 men. The fishery expanded in 1877 with the addition of two new canneries. One down near Ladner's was operated by Finlayson and Lane, with Peter Birrell managing. Opening at Brownsville was the modern and spacious facility of the English & Co Cannery. A description of the cannery appears in the Mainland Guardian of August 11, 1877. This fine establishment belongs to our enterprising fellow citizen, E. Brown, Esq. MPP, who, with a large outlay, erected the buildings in question; his public spirit doing much to develop the valuable business which now forms so prominent a feature in this city. The cannery industry had transformed the waterfront on the south side of the river. The land hitherto the object of great efforts of clearing and cultivation for the produce of the soil, was being taken over by mammoth sheds, wharfs, and machinery. In equipment alone the investment was huge, with steamboats, sail-boats, nets, and a plant on-site to manufacture the cans, the nets and the packing-cases. The cannery being powered by steam, there were separate engine and charcoal houses. Ebenezer Brown announced the construction of another cannery further upriver from English's. Mr E Brown, proprietor of the extensive premises known as English & Co's Cannery, is about to erect premises just above English & Co's for a like purpose. Although the structure will only cover about 4200 square superficial yards, it will so constructed as to serve all the purposes of the former, and afford even more facility from the most approved modern form being adopted. The new buildings will have a most effective appearance, as the upper portion of the main structure will have an elevation of seventy feet from the floor. The new cannery was built in Lot 11, B5N R2W, opposite Tree Island and the mouth of the Coquitlam River, at the start of the Girard road to Langley. It was operated by Benjamin Haigh under the name Quoquitlam (Coquitlam) Cannery, later Haigh and Sons. In its latter years under the proprietorship of Daniel J. Munn it would be known as the Bon Accord Cannery. Marshall Martin English, operator of the cannery at Brownsville, hailed from a prominent family in Virginia. Associates of English in running the cannery were John Adair and Samuel B Martin, with a financial interest by William T Coleman of San Francisco, who was the selling agent for the cannery's output. Down at Mud Bay, towards the southern end of the Semiahmoo Trail, loggers were harvesting the extensive timber lands. A concern, expressed as early as 1877, was the loss of jobs due to the export of raw logs to mills on Puget Sound. A very valuable belt of timber at Mud Bay is being rapidly removed to American mills on the Sound and manufactured into lumber. It was said that upwards of 5 million feet of timber had been cut and exported, at a great loss to the economy of British Columbia. 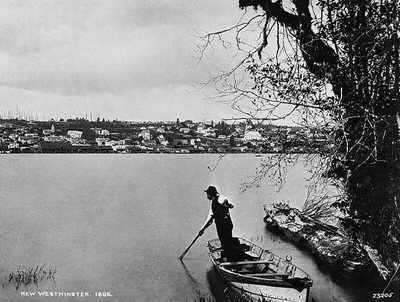 Roads remained the main issue for settlers in New Westminster District. In June 1878, a petition signed by 160 men, mostly at Halls Prairie and Clover Valley, called for better road access to the City. The settlers on Halls Prairie and vicinity are compelled to pass through American Territory (USA) in order to obtain an outlet. The old trail from Hall's Prairie to Shaw's Bluff remained the main road. At the busy place now generally called Brownsville, a new generation of agriculturalist, in an add reminiscent of Herring's 17 years before, offered milk for sale at three bits per gallon. Robert Johnston, the farm proprietor, also operated the Hotel, all under lease from Ebenezer Brown. The Brownsville Hotel was a favourite stopping place for travelers and a venue for dances and parties held by the city dwellers from across the river. Long time neighbour and sometime adversary, Ebenezer Brown, arrived back from his trip to England a few days too late to attend the funeral for Sam Herring, who passed away at the age of 49. Smuggling! There is good reason for believing that no inconsiderable amount of smuggling is done in our frontier settlements bordering on the sea, where all possible convenience exists for carrying on much illicit trade with impunity, and we respectfully submit, whether the time has not come when the services of a Revenue Officer should be brought into requisition. It is quite certain that the legitimate trade of this city is suffering there from. The districts near the border, Hall's Prairie and Mud Bay, had been dependent for years on supplies obtained at Semiahmoo and places along the coast. Trading sloops ventured up the Tah–ta–loo (Campbell) River. Among those engaged so engaged were neighbours at Hall's Prairie William Brown and AJ Watson, partners in a sloop. Others made Nicomekl their port of call. Among these were Charles Hunt and James Hatt, both coastal traders of the old mould, with native wives, who homesteaded on the river above Blackie's Spit. Settlers just south of the line were dependent on the Canadian side too. They freely grazed their cattle on the natural pastures of Hall's Prairie and at Mud Bay. New Westminster had subscribed money to finance the opening of the Semiahmoo Road, expecting thereby to profit from additional trade. This did not materialize to any great extent, as farmers lower down continued to take the easier routes to Semiahmoo and even to Victoria. It was Colonel Moody's commercial fears of 1859 coming to pass, though on a much smaller scale than he imagined.